World War II was a terrible armed conflict. The war lasted almost throughout the world between 1939 and 1945. It raises a lot of casualties, damage to infrastructure, public facilities, and material losses. Many people become disabled. The first party consisted of Germany, Italy and Japan, the so-called Axis powers. The second party is allied powers, France, Britain, the United States, the Soviet Union, and China. The war caused by Germany's defeat in World War I, intending to avenge the defeat. They harmed the Treaty of Versailles. Germany led by Adolf Hitler, the leader of the Socialist (NSDAP) of the National Socialist German Workers Party or Nazi party. He was very totalitarian. Ultra-nationalist ideology and anti-Semitic. Italy led by Benito Mussolini, the fascist dictator of Italy. 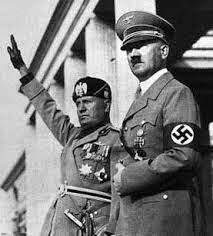 He collaborated with Hitler's secret Italian-German agreement in the Tripartite pact. It will lead to the formation of the Roman-Berlin Axis. The added strength of Asian countries, Japan. War begins with an attack Germany to Austria. It happened in March 1938. Furthermore, Hitler began to invade Poland on September 1, 1939. This triggered a reaction from allies, especially Britain and France. They declared war on Germany. In April 1940, Hitler's tactics "blitzkrieg" in ordering the invasion of Norway and the occupation of the main airfield Oslo and Stavanger. At the same time, Germany sent warships to the port of Copenhagen and was introduced to the Jutland peninsula. Danish occupation was necessary to the security of German communications with Norway. The Soviet Union occupied the Baltic states in June 1940, and annexed them in August 1940. Italy, a member of the Axis, entered the war in June 1940. From August 13 to October 31, 1940, the Nazi air attack on the British known as the "Battle of Britain "campaign. Germany to do stupid things. It happened when Germany invaded the Soviet Union on June 22, 1941. That means that Germany violated the German-Soviet pact. The goal is to master the Baltic. The events that led to Russia's joining the bloc allies. On December 7, 1941, Japan (one of the Axis powers) bombed Pearl Harbor, Hawaii. United States immediately declared war on Japan. On December 11, Germany and Italy declared war on the United States. Instead, America is determined to avenge the attack. This is called the Pacific war. Americans took all his strength to attack Japan. United States Navy amphibious use or to scroll through the island chain to the Japanese troops, while ground forces smaller scale cooperate with Chinese and English in Asia. Meanwhile Germany also began to experience defeat by the British in North Africa. Army Germans surrendered in May 1943. Hitler finally despair he committed suicide on 30 April 1945. Delivery of the final German forces was signed on May 8th. The war had officially ended in Europe. 0 Response to "History of World War II"